my wonderful gifts from Cadry! Did any of you do the retro-blogging-postcard-swap that Cadry organized? I loved that idea and signed up right away. Well, guess what? I got a package from Cadry herself! Lucky me! 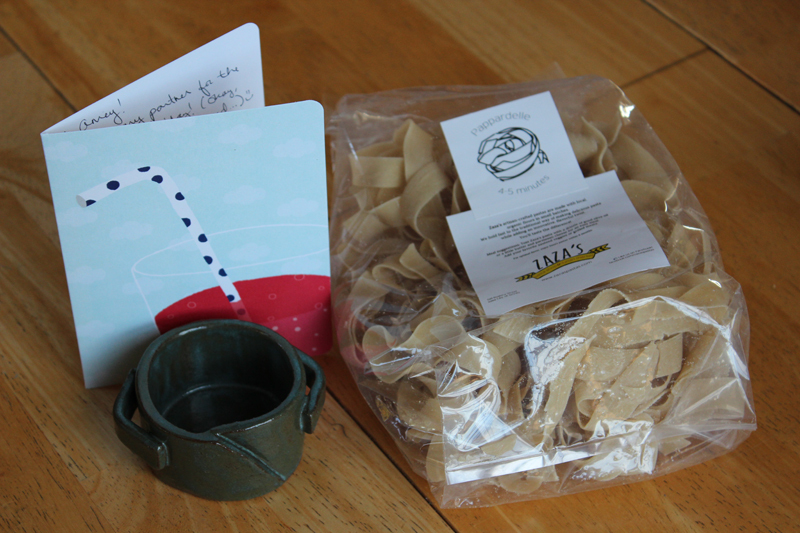 She sent me a lovely package of locally-made artisan pasta, a very touching card, and *a super awesome little ceramic bowl that she made! * So lovely! 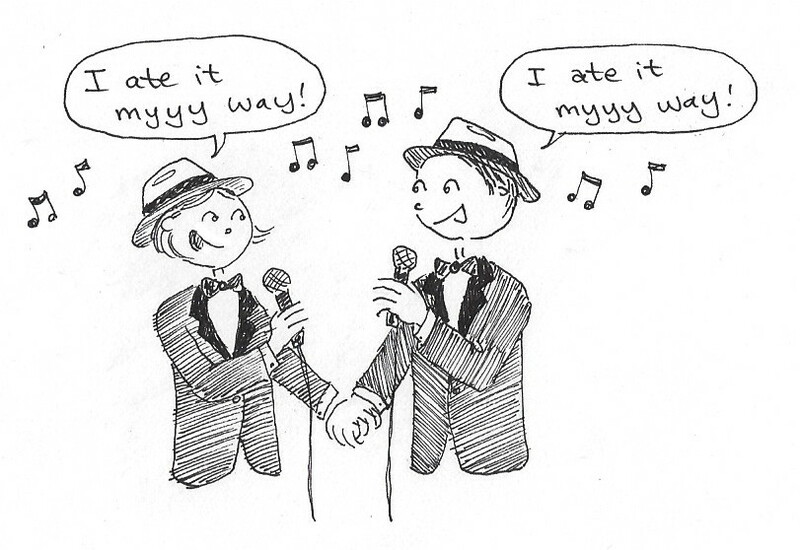 Back in the early days of our relationship, Mr. VE&T and I ate a TON of pasta. I'm sure we had pasta at least three times a week. But, at some point we both started watching our weight and counting calories, and now we don't eat nearly as much pasta. We don't love it any less, though! So, this pasta from Cadry was a super awesome surprise, and just the right amount for two good servings. 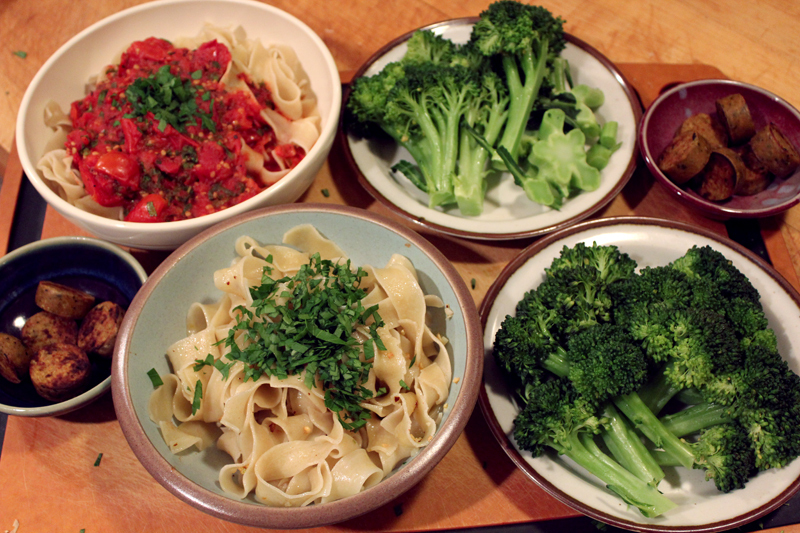 One result of eating pasta less often is that we have different fantasy pasta dishes. Mr. VE&T is all about the red sauce. Meanwhile, I like red sauce, but my heart lies firmly in the Pasta Aglio-Olio camp. Man, I love that stuff. So, last night I decided to make a fun His & Hers Pasta Dinner - where we each got our favorite thing. I used some of our fresh tomatoes and cooked up a light tomato sauce for Mr VE&T ~ with tomatoes, garlic, dried oregano & thyme, fresh basil and a touch of olive oil and salt. Mine was just classic: olive oil, garlic, a pinch of red pepper flakes, a pinch of salt, and fresh parsley. That pasta was SO GOOD. I loved the big wide ribbons, and the texture was perfect! I can be a bit of a pasta snob, so that's no faint praise! In keeping with the theme of the evening, We also had His and Hers Broccoli ~ Mr VE&T got all the stems (his favorite part), while my plate focused on the florets (my favorite part). We also had a Tofurkey Spinach Pesto Sausage on the side. Have you tried that flavor? They are really good, and went great with this meal! Usually I can't be bothered to make two dishes for dinner, and one of just settles for having something that isn't our top choice. This seemed like an easy enough way to make both of us super happy... and it was! I saw Cadry's post card exchange, loved the idea but unfortunately did not partake. So cool you matched up with Cadry though! Love having his & hers pasta night...that's the same in our household. I make whole wheat penne for him and zucchini noodles for me...and then we do the same topping- either "meat" sauce or some fun vegan meatballs or pesto! I love this his and hers meal. You two are the cutest couple! I agree with Mia, you are the cutest! That pasta looks beautiful, such pretty ribbons. 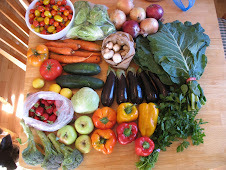 I can tell be looking at it that it is a cut above the regular stuff. Yum. Mmmm they both sound brilliant! I'm kicking myself that I forgot to sign up to the postcard swap - so silly! That looks like a great meal, Nick and I have broccoli preferences too, I'm all about the stems and he's all about the florets! Yay!! I loved this post, and I'm so glad that you enjoyed the pasta!! I'm totally with you on the Pasta Aglio-Olio camp. How sweet! I'm with Mr. VE&T; I like the stems!